In 1903, Italian pathologists Marchiafava and Bignami described 3 alcoholic men who died after having seizures and coma. In each patient, the middle two thirds of the corpus callosum was found to be severely necrotic. Through the years, the medical literature accumulated hundreds of cases of MBD. Most of these cases were found in alcoholic men. Type B - Characterized by normal or mildly impaired mental status; radiologic features are partial or focal callosal lesions (see the image below). T2-weighted axial image in a patient with Marchiafava-Bignami disease showing a high-signal lesion in the corpus callosum. Although Morel did not report an association between cortical laminar sclerosis and MBD, many subsequent authors did, including Jequier and Wildi in 1956  and Delay et al in 1959. [10, 11] Indeed, Ropper et al stated in 2005,  in Adams and Victor's Principles of Neurology, that Jequier and Adams (in an otherwise unpublished review) reexamined Morel's slides and found evidence of MBD in all of those cases. Thus, the prevailing view has generally been that Morel cortical laminar sclerosis is secondary to MBD. Nevertheless, in 1978, Naeije et al reported a case of Morel cortical laminar sclerosis in an alcoholic woman who did not have MBD. In addition, Okeda et al reported 3 cases of cortical laminar sclerosis in 1986 in patients who had various combinations of pontine and extrapontine myelinolysis but who did not have MBD. One of these patients had alcoholic cirrhosis and 2 had malignancies. Although this disease occurs in both sexes, most cases are found in men. Most cases of MBD occur in persons older than 45 years. Alcohol abuse is such a common problem that underdiagnosis of MBD seems likely (although now, with the availability MRI, fewer cases are going undiagnosed). In addition, many cases of MBD may be diagnosed but not reported, and autopsies are largely not performed. Hence, the disease may be more common than thought, and the overall outcome may be better than previously believed. The authors of this article have estimated that approximately 300 cases of MBD turned up in published reports between 1966 and November 2008. Another 40 or 50 cases have been mentioned in textbooks that are too old to have been included in the author's PubMed search. International cases of MBD are similar to US cases, but 1 additional detail deserves mention. Some of the old literature on MBD suggested that this condition was more common in Italians. This was solely an artifact of the initial cases having been found in Italy and the fact that, at first, Italian physicians were apparently the only investigators interested in finding such cases. MBD has since been found in persons from all over the world. In the era before CT scanning, MBD was found almost exclusively at autopsy. Patients with the condition usually died from the effects of alcoholism and typically had severe neuropsychological deficits before death. Helenius et al reported in 2004 that among approximately 250 known patients with MBD, 200 died, 30 remained severely demented or bedridden, and only 20 had a favorable outcome. If the underlying cause of MBD is alcoholism, the prognosis is poor unless the patient adheres to an alcohol treatment program. However, modern CT scanning and MRI have allowed the detection of mild cases of the disease, and some patients have recovered with minimal deficits. Moreover, data suggest an improved overall prognosis for MBD. In a 2004 review of acute and chronic cases of MBD, Heinrich et al separated most cases into 2 groups. Group A included the worst cases, in which patients presented with coma or other severe impairment of consciousness. 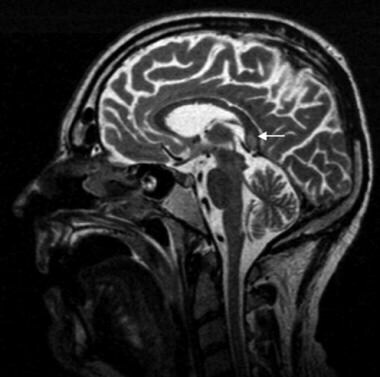 On MRI scans, their lesions typically involved most or all of the corpus callosum. For example, in the acute phase, the entire corpus callosum was commonly hyperintense on T2-weighted MRI scans. As the lesions evolved, considerable necrosis occurred, and cystic areas of necrosis were present in most or many regions of the corpus callosum. The death rate for patients with such presentations was high (21%), and those who lived frequently had severe deficits. In group B, patients had little or no impairment of consciousness. Their deficits were subtle and included various cognitive difficulties and signs of impaired interhemispheric information transfer, gait disturbances, dysarthria, limb hypotonia, and rare seizures or upper motor neuron signs. Initial hyperintense lesions on T2-weighted MRI scans were limited to a few areas of the corpus callosum. Some cystic necrotic areas developed over time, but they were fewer and smaller than those in type A. No deaths occurred in this group, and patients frequently had good recoveries. The authors did not attempt to correlate the severity of the cases with the presumed causes. Patients with the most severe alcoholism might have been in group A, but this is speculation. In both groups, the amount of early callosal edema in the acute phase often markedly exceeded the areas of ultimate cystic necrosis. However, as pointed out by Khaw et al in 2006,  the older literature, such as that by Brion, from 1977,  does not support a correlation between laminar sclerosis and bad outcome. In addition, studies such as that by Hlaihel et al from 2006  do not support a correlation between reduced apparent diffusion coefficient and poor prognosis or even with irreversibility of the lesion. Finally, they noted that cortical MRI findings have not been definitively correlated with the specific pathology of Morel cortical laminar sclerosis. However, if indeed they represent laminar sclerosis, the fact that this is present in the acute or subacute stages of MBD may force a reevaluation of the thought that laminar sclerosis is a secondary consequence of the MBD. Marchiafava E, Bignami A. Sopra un alterazione del corpo calloso osservata in soggetti alcoolisti. Riv Patol Nerv. 1903. 8:544. Heinrich A, Runge U, Khaw AV. Clinicoradiologic subtypes of Marchiafava-Bignami disease. J Neurol. 2004 Sep. 251(9):1050-9. [Medline]. Fernandes LMP, Bezerra FR, Monteiro MC, Silva ML, de Oliveira FR, Lima RR, et al. Thiamine deficiency, oxidative metabolic pathways and ethanol-induced neurotoxicity: how poor nutrition contributes to the alcoholic syndrome, as Marchiafava-Bignami disease. Eur J Clin Nutr. May 2017. 71(5):580-586. Kilinc O, Ozbek D, Ozkan E, Midi I. Neurological and Psychiatric Findings of Marchiafava-Bignami Disease in a Nonalcoholic Diabetic Patient With High Blood Glucose Levels. J Neuropsychiatry Clin Neurosci. 2015. 27(2):e149-50. Pérez Álvarez AI, Ramón Carbajo C, Morís de la Tassa G, Pascual Gómez J. Marchiafava-Bignami disease triggered by poorly controlled diabetes mellitus. Neurologia. 2016 Sep. 31(7):498-500. Jorge JM, Gold M, Sternman D, Prabhakaran K, Yelon J. Marchiafava-Bignami disease in a trauma patient. J Emerg Trauma Shock. 2015 Jan. 8(1):52-54. Morel F. Une forme anatomo-clinique particuliere de l;alcoolisme chronique: Sclerose corticale laminaire alcoolique. Rev Neurol. Rev Neurol. 1939. 71:280-288. Jequier M, Wildi E. Not Available. Schweiz Arch Neurol Psychiatr. 1956. 77(1-2):393-415. [Medline]. DELAY J, BRION S, ESCOUROLLE R, SANCHEZ A. [Necrosis of the Marchiafava-Bignami corpus callosum and Morel's cortical laminar sclerosis.]. Rev Neurol (Paris). 1959 Oct. 101:560-2. [Medline]. DELAY J, BRION S, ESCOUROLLE R, SANCHEZ A. [Relation between Marchiafava-Bignami degeneration of the corpus callosum and Morel's cortical laminar sclerosis (apropos of 5 anatomo-clinical case reports).]. Encephale. 1959. 48:281-312. [Medline]. Ropper AH, Brown RH. Chapter 41 Diseases of the Nervous System due to Nutritiozal Deficiency. Marchiafava-Bignami Disease(Primary Degeneration of theCorpus Callosum). In: Principles of Neurology. 2005. 998-999. Naeije R, Franken L, Jacobovitz D, et al. Morel's laminar sclerosis. Eur Neurol. 1978. 17(3):155-9. [Medline]. Okeda R, Kitano M, Sawabe M, et al. Distribution of demyelinating lesions in pontine and extrapontine myelinolysis--three autopsy cases including one case devoid of central pontine myelinolysis. Acta Neuropathol (Berl). 1986. 69(3-4):259-66. [Medline]. Helenius J, Tatlisumak T, Soinne L, et al. Marchiafava-Bignami disease: two cases with favourable outcome. Eur J Neurol. 2001 May. 8(3):269-72. [Medline]. Staszewski J, Macek K, Stepien A. [Reversible demyelinisation of corpus callosum in the course of Marchiafava-Bignami disease]. Neurol Neurochir Pol. 2006 Mar-Apr. 40(2):156-61. [Medline]. Menegon P, Sibon I, Pachai C, et al. Marchiafava-Bignami disease: diffusion-weighted MRI in corpus callosum and cortical lesions. Neurology. 2005 Aug 9. 65(3):475-7. [Medline]. Khaw AV, Heinrich A. Marchiafava-Bignami disease: diffusion-weighted MRI in corpus callosum and cortical lesions. Neurology. 2006 Apr 25. 66(8):1286; author reply 1286. [Medline]. Brion S. Marchiafava-Bignami disease. Vinken PJ, Bruyn GW, eds. Handbook of clinical neurology. Amsterdam: North H; 1977. 317. Hlaihel C, Gonnaud PM, Champin S, et al. Diffusion-weighted magnetic resonance imaging in Marchiafava-Bignami disease: follow-up studies. Neuroradiology. 2005 Jul. 47(7):520-4. [Medline]. Hirayama K, Tachibana K, Abe N, Manabe H, Fuse T, Tsukamoto T. Simultaneously cooperative, but serially antagonistic: a neuropsychological study of diagonistic dyspraxia in a case of Marchiafava-Bignami disease. Behav Neurol. 2008. 19(3):137-44. [Medline]. Fang SC. EEG coherence for a patient with Marchiafava-Bignami disease. Clin EEG Neurosci. October 2007. 38(pt 4):207. Lee SH, Kim SS, Kim SH, Lee SY. Acute Marchiafava-Bignami disease with selective involvement of the precentral cortex and splenium: a serial magnetic resonance imaging study. Neurologist. 2011 Jul. 17(4):213-7. [Medline]. Yoshizaki T, Hashimoto T, Fujimoto K, Oguchi K. Evolution of Callosal and Cortical Lesions on MRI in Marchiafava-Bignami Disease. Case Rep Neurol. 2010 Mar 23. 2(1):19-23. [Medline]. [Full Text]. Sair HI, Mohamed FB, Patel S, Kanamalla US, Hershey B, Hakma Z, et al. Diffusion tensor imaging and fiber-tracking in Marchiafava-Bignami disease. J Neuroimaging. 2006 Jul. 16(3):281-5. [Medline]. Ihn YK, Hwang SS, Park YH. Acute Marchiafava-Bignami disease: diffusion-weighted MRI in cortical and callosal involvement. Yonsei Med J. 2007 Apr 30. 48(2):321-4. [Medline]. Hillbom M, Saloheimo P, Fujioka S, Wszolek ZK, Juvela S, Leone MA. Diagnosis and management of Marchiafava-Bignami disease: a review of CT/MRI confirmed cases. J Neurol Neurosurg Psychiatry. 2014 Feb. 85(2):168-73. [Medline]. [Full Text]. Kikkawa Y, Takaya Y, Niwa N. [A case of Marchiafava-Bignami disease that responded to high-dose intravenous corticosteroid administration]. Rinsho Shinkeigaku. 2000 Nov. 40(11):1122-5. [Medline]. Celik Y, Temizoz O, Genchellac H, Cakir B, Asil T. A non-alcoholic patient with acute Marchiafava-Bignami disease associated with gynecologic malignancy: paraneoplastic Marchiafava-Bignami disease?. Clin Neurol Neurosurg. 2007 Jul. 109(6):505-8. [Medline]. Rusche-Skolarus LE, Lucey BP, Vo KD, Snider BJ. Transient encephalopathy in a postoperative non-alcoholic female with Marchiafava-Bignami disease. Clin Neurol Neurosurg. 2007. 109:713-5. Ferracci F, Conte F, Gentile M, et al. Marchiafava-Bignami disease: computed tomographic scan, 99mTc HMPAO-SPECT, and FLAIR MRI findings in a patient with subcortical aphasia, alexia, bilateral agraphia, and left-handed deficit of constructional ability. Arch Neurol. 1999 Jan. 56(1):107-10. [Medline]. Gambini A, Falini A, Moiola L, et al. Marchiafava-Bignami disease: longitudinal MR imaging and MR spectroscopy study. AJNR Am J Neuroradiol. 2003 Feb. 24(2):249-53. [Medline]. Johkura K, Naito M, Naka T. Cortical involvement in Marchiafava-Bignami disease. AJNR Am J Neuroradiol. 2005 Mar. 26(3):670-3. [Medline]. Nardone R, Venturi A, Buffone E, et al. Transcranial magnetic stimulation shows impaired transcallosal inhibition in Marchiafava-Bignami syndrome. Eur J Neurol. 2006 Jul. 13(7):749-53. [Medline]. Sagittal fluid attenuation and inversion recovery image displaying central hypointensity (suggesting cavitation) with surrounding hyperintense rim (active inflammation) (white arrowheads) involving the genu, body, and splenium of corpus callosum. Courtesy of Case Reports in Radiology, Hindawi Publishing Corp.
Disclosure: Received grant/research funds from Janssen Pharmaceuticals for pi conpensation.